Piazza del Carmine is one of the main squares of the Oltrarno area of Florence and is dominated by the majestic Church of Santa Maria del Carmine. Today the piazza is cradled by the unfinished facade of the basilica, while to the south you can see the dome of the nearby Church of San Frediano in Cestello. Next to the Santa Maria del Carmine church door it is possible to visit the ancient monastery of the church, as well as a museum that allows access to the Brancacci Chapel. Across the street lies the only major building with a facade looking onto on the square: the Palazzo Rospigliosi Pallavicini, seat of the Women's Missionary College of St. Francis of Assisi. 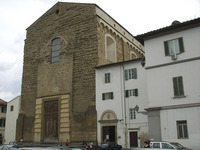 On the corner of the square lies a large tabernacle, a 14th century work attributed to the master San Martino a Mensola. The tabernacle represents a Madonna with child and two saints. On the corner of Via Santa Monica lies a second tabernacle made of sandstone and attributed to an artist from Tyrol. A third tabernacle, representing the Holy Family, is located on the corner of Borgo San Frediano. The piazza is one of the few remaining piazzas of the historic center of Florence where you can still experience a genuine neighborhood atmosphere that has not yet been overwhelmed by mass tourism. The profoundly religious character of the square has in recent decades been accompanied by the spirit of busting nightlife, as a host of nightclubs in the area make it a prime destination for young people.